James Panozzo, Founder and Executive Director of Launch LA, in collaboration with Mar Hollingsworth, Program Manager and Visual Arts Curator, CAAM, Los Angeles, selected the artists in this group. The artwork on display includes both two and three-dimensional works, and ranges from figurative depictions to highly abstracted forms, from acrylic on canvas paintings to mixed-media collage, and clay sculptures to assemblage with found objects. April Bey’s complex, layered works on panel are created using oil paint, wax fabric, and epoxy resin. She employs a visually charged graphic-design style complemented by text, rooted in popular culture and mass media communication, to raise issues of Black empowerment and feminism. Chukes creates clay sculptures of subtle anatomical distortions and unusual colors while achieving a magisterial balance that defies the laws of gravity. Devoted to the human form, his life-size sculptures are as poetic as they are political. Chuke’s male and female forms celebrate Blackness while their materiality, poses and attitude raise awareness of the urgency for militancy. June Edmond’s vibrant, textural paintings are a visual feast, demonstrating both technical skill and knowledge of color theory. The artist’s concentric shapes and repeated impastoed brushstrokes become the ultimate invitation to transcend the harshness of daily life in search of deeper meaning. Loren Holland paints idyllic, detailed landscapes filled with strong women of color that possess a surreal quality. Upon closer inspection, these outdoor vistas often reflect a crude dystopia, and the women, while assertive, display traces of vulnerability and despair. Duane Paul builds complex, sensuous sculptures that mix organic forms with geometric, architectural elements. The artist brings together fragments he casts in his own studio, and found/industrial objects, to create dynamic sculptures that reflect the lusciousness and vibrancy of urban life. Miles Regis works contain a mix of figurative and abstract elements created through a combination of paint dripping and fabric and paper collage. 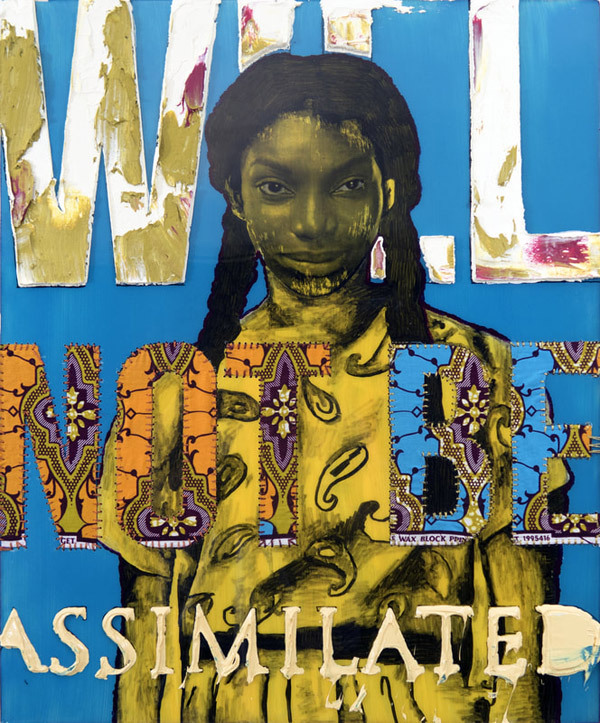 The artist mixes these disparate elements to create vibrant and colorful canvases in which he explores a variety of issues, from racism to identity politics as well as concepts of beauty and ethnic pride. Ana Rodriguez’s organic and patterned home interiors explore a social construct of objects and decorations based on her own childhood imagery. Through her work, the artist explores how flooring, wallpaper, house plants, and other furnishings, contribute to a larger social framing and individual identity. Nano Rubio’s creative process combines meticulous drawing with action painting, producing deeply prophetic and rebellious works that explore the uncertainty of our times and the likeliness of a dystopian future. Holly Tempo reflects on her Inglewood neighborhood to depict abstract landscapes and maps coded with personal symbols and charged with socio-political commentary. Her mixed media paintings capture the colors and textures of the artist’s urban surroundings, including spray paint and rugged surfaces. Tim Washington builds detailed sculptures by applying cotton dipped in glue to a wire armature, and then embedding the surface with small toys and found objects. These works tell stories about his dreams of a Utopian, conciliatory future in which humanity has finally overcome prejudice.